This post will guide you how to use Excel CEILING function with syntax and examples in Microsoft excel. 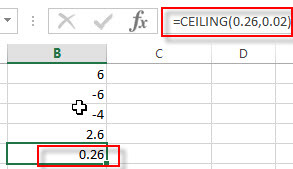 The Excel CEILING function returns a given number rounded up to the nearest multiple of a given number of significance. So you can use the CEILING function to round up a number to the nearest multiple of a given number. The CEILING function is a build-in function in Microsoft Excel and it is categorized as a Math and Trigonometry Function. The CEILING function is available in Excel 2016, Excel 2013, Excel 2010, Excel 2007, Excel 2003, Excel XP, Excel 2000, Excel 2011 for Mac. number – This is a required argument. The number that you want to round up. significance – This is a required argument. The multiple of significance to which you want to round a number to. If either number and significance arguments are non-numeric, the CEILING function will return the #VALUE! Error. If the number argument is negative, and the significance argument is also negative, the number is rounded down, and it will be away from 0. If the number argument is negative and the significance is positive, the number is rounded up towards zero. The below examples will show you how to use Excel CEILING Function to round a number up to nearest multiple. 1# to round 4.6 up to nearest multiple of 3, enter the following formula in Cell B1. 2# to round -4.6 up to nearest multiple of -3, enter the following formula in Cell B2. 3# to round -4.6 up to nearest multiple of 2, enter the following formula in Cell B3. 4# to round 2.6 up to nearest multiple of 0.2, enter the following formula in Cell B4. 5# to round 0.26 up to nearest multiple of 0.02, enter the following formula in Cell B5.